It’s been a long harvest so far!!! Well…from my perspective anyway! Balancing harvest with taking care of Mattie has been a challenge. She is doing better though and is learning to walk on three legs. Sometimes she forgets and takes off running and falls…breaks my heart every time it happens. I am trying to get her off her pain medication too. I am sure she will be running around the yard soon like nothing ever happened. Yesterday called for something I hadn’t had before. 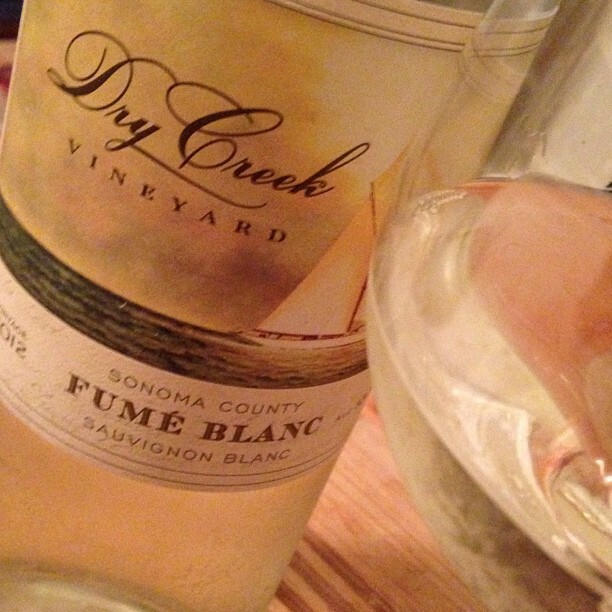 Dry Creek Vineyard 2012 Sonoma County Fume Blanc. I usually don’t drink Fume Blanc. I had heard about this wine and had to try it. Reason being, it is a Fume Blanc fermented in stainless steel. No oak!!! My kind of wine! This wine has 13.5% alc by volume. Love the lemon and lime aroma dancing in the glass. A great citrus combination with a little grassy note. On the palate a very well-balanced lemon, lime, and lychee nut. Balanced acidity and easy to drink. It was definitely a great glass of wine (well actually two glasses) for the end of a very long day. I am planning on finishing the bottle when I get home this evening!